Jill grew up on Crooked Lake in Kalamazoo, Michigan. She lived there until her senior year of high school when her family moved to Wilmington, Delaware. She did undergraduate work at High Point College in North Carolina and also attended Georgia Southwestern College in Americus, Georgia. She studied various visual media, but her major courses of study were English Literature and biology. Jill has participated in various solo and juried exhibitions around the state of Georgia and her work received recognition at many of them. Jill was represented by the Decatur Market & Gallery in Atlanta. 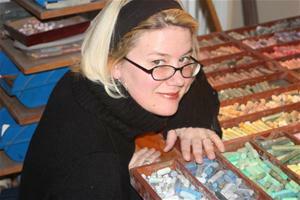 Her work is included in several corporate and private collections. Recently relocated to New England, Jill lives with her husband as a year round resident of Cape Cod. "The unique style and detail of my works are enhanced by the many years growing up on the banks of Crooked Lake. All our fun and exploration centered around the water. We were constantly catching crayfish, turtles and weird water bugs. I have carried those idyllic lake days down through the years and now my paintings are full of those water memories. I am most interested in painting the many moods and color changes of different bodies of water at any given time. Reflections and depth constantly changing with wind and weather. I am always trying to capture an elusive transparency that allows you to see the surface and under the water at the same time. Always I am remembering a little girl in the shallows watching the minnows nibble her toes."